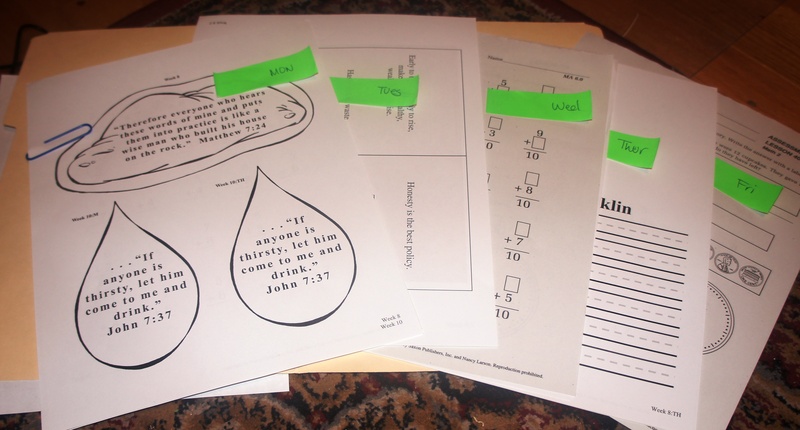 We started Homeschool again last Monday! I have been stressing out all summer about the “starting” of school this year. 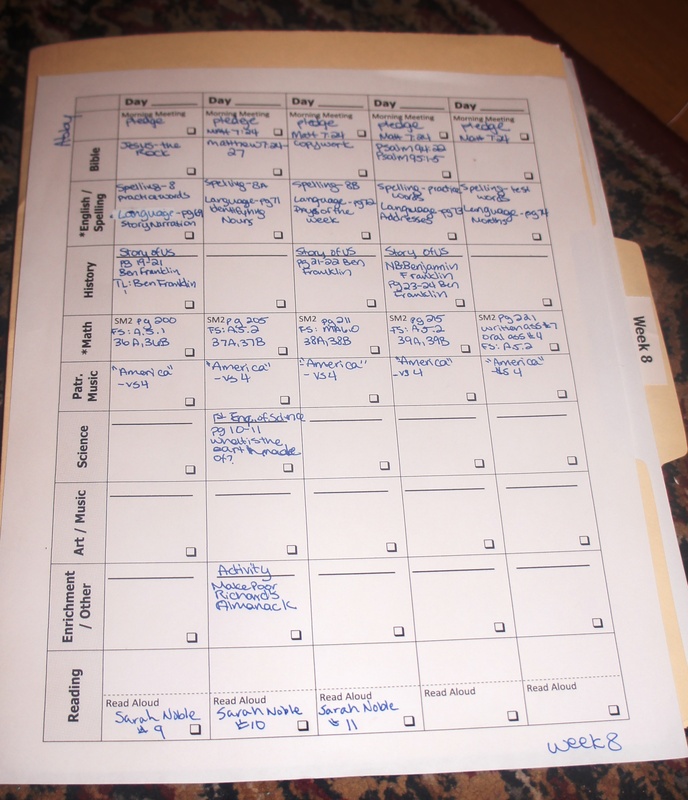 How will I get things done? Can I handle it with everything else I have to deal with? Really, all of that didn’t help with the burnout I was dealing with either. In fact, taking the break this summer didn’t really help, either. You wanna know what did help? Yeah, so apparently my girls and I just thrive on a routine. The first month of break they loved it – with company visits, the trip to the homeschool convention, VBS – they enjoyed all the free time to play. But by early July, they were over it. I mean, what kids ASK for school? Homeschool kids, apparently! The only problem was I just wasn’t organized and ready! Here are my girls, ages 7 and 5, before entering the room! 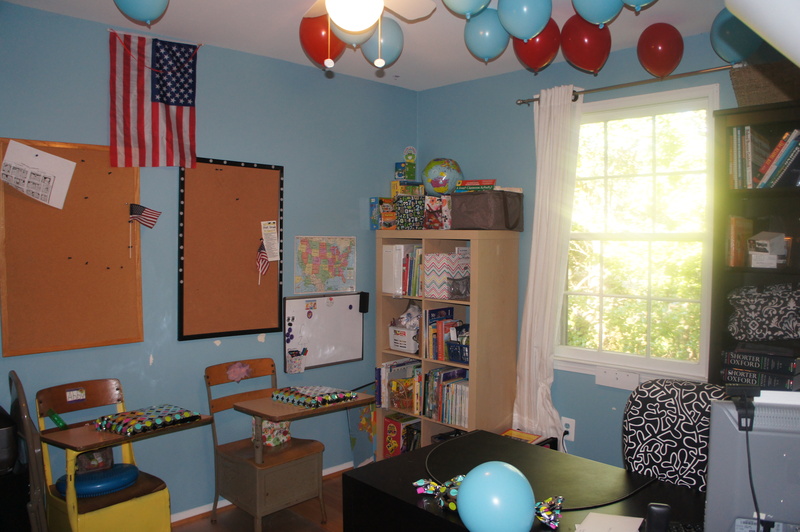 Looking for ideas to make the first day back to school cool and fun, I found leftover balloons from the girls’ birthday parties and part of the leftover helium tank. As soon as they were asleep in bed, I went to work and filled the balloons until the tank ran out. By the way, if you decide to do this, do NOT turn on your ceiling fan while there are balloons in the room! Just a PSA! And here is the view directly from the door, of the classroom side of the room. Enjoy this picture, it probably won’t be this clean for another year! 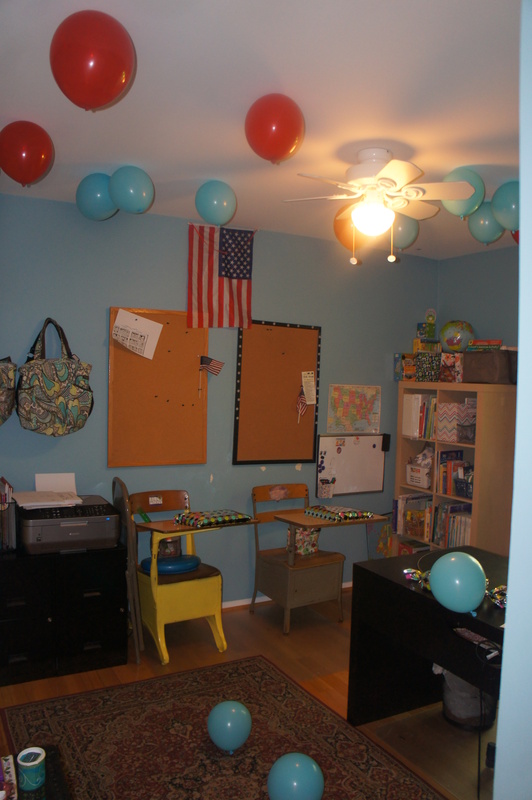 The balloons were a big hit, and the girls got a kick of them floating down as they started to lose their helium. They ended up taking them all down to the playroom after school to play with them more. Now, someone spied in an earlier post that I had wrapped “presents” on their desks when they arrived! And yes, that is true. What were their presents, you ask? Why their workbooks, notebooks and school items, of course! Before they opened these presents, I sat them down and told them that I wanted them to always remember that getting to homeschool is a gift, a gift not everyone gets to have. (This is something I’ve told them many times before.) 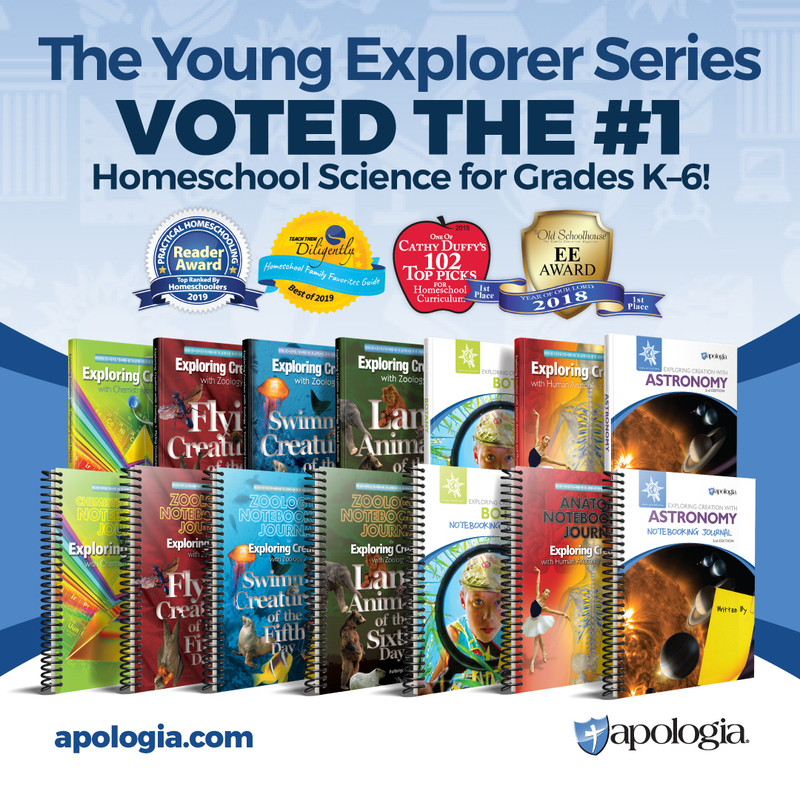 I want to make sure they appreciate that this is a wonderful opportunity we need to treasure while we have it, and to understand that not everyone gets to homeschool, for whatever reason. This is my personal belief about homeschooling and I want to impart that on the girls. We’re not better than those that choose public school, we’re not worse. But being able to spend our time together and learn at home – that’s a gift we have in our family right now that we should treasure. 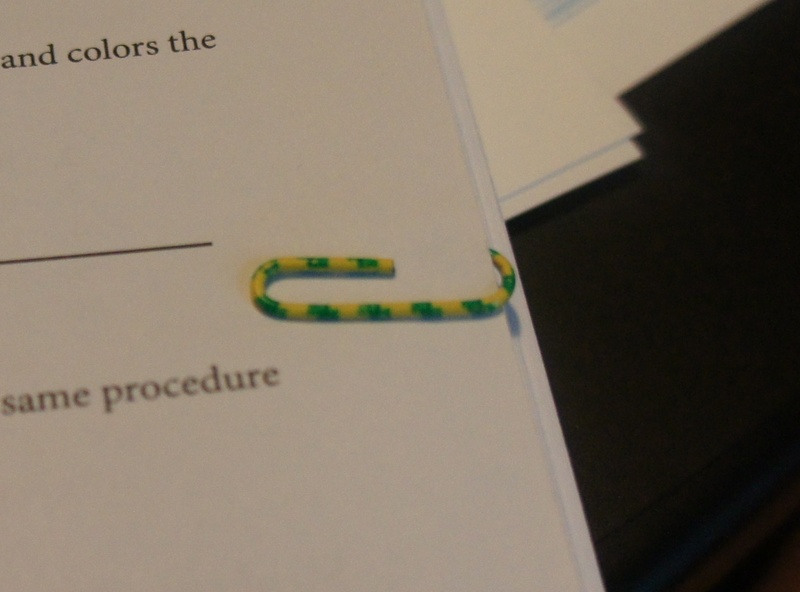 I also had a special snack for the afternoon wrapped up as a gift on my desk, to open after lunch. They each got a box of animal crackers and a page about an activity to do with the animal crackers (making a graph of how many which animals were in the box). And then it was time to buckle down and start school! Now that we’re past our first week of school and going through our second, I’m very happy to report that everything is going very well so far, and much more smoothly than I expected! And we are all looking forward to school this year! 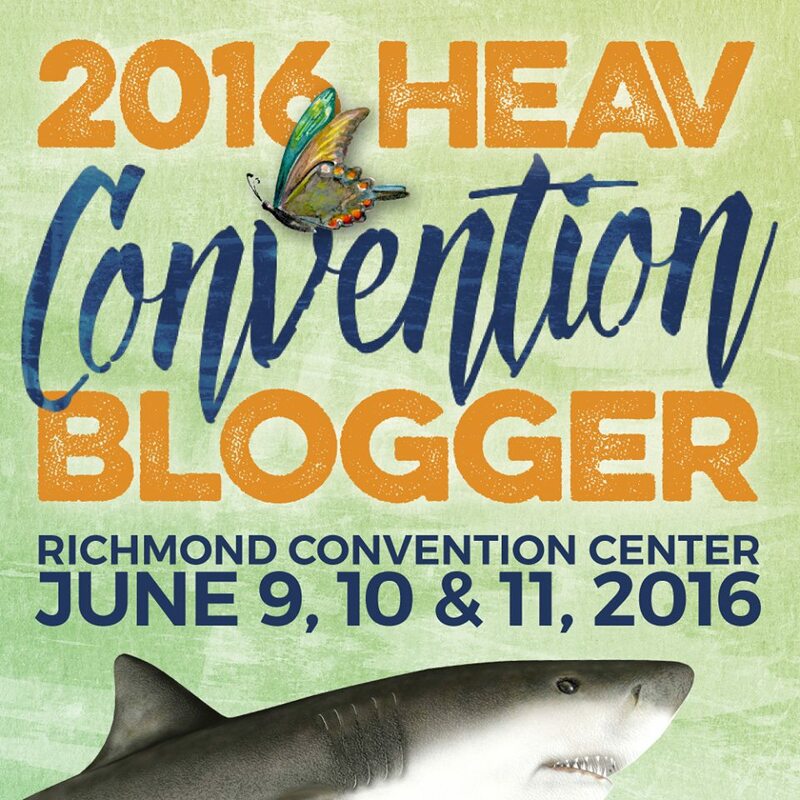 Another Year, Another Post About Organizing Homeschool! First off, of course I decided not to fix what isn’t broken! I love that our classroom is combined with my office, and the layout of the room is working well. So, that is staying. Pretty much everything is staying, except everything remotely related to preschool and kindergarten curriculum. Wow, I had so much stuff to get rid of! This last time through I came up with an entire laundry basket of stuff left, even after passing along a huge bin of stuff! 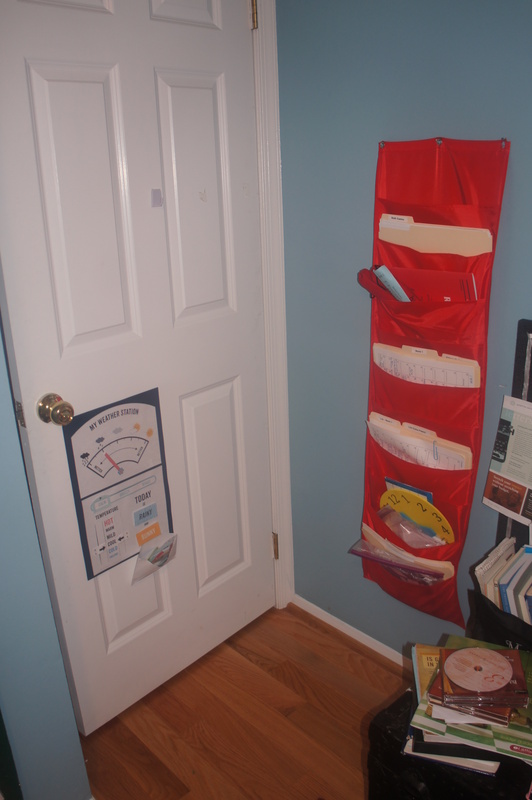 Behind our door, we have our file holder, and weather chart. Just to the left of the door is our felt calendar. 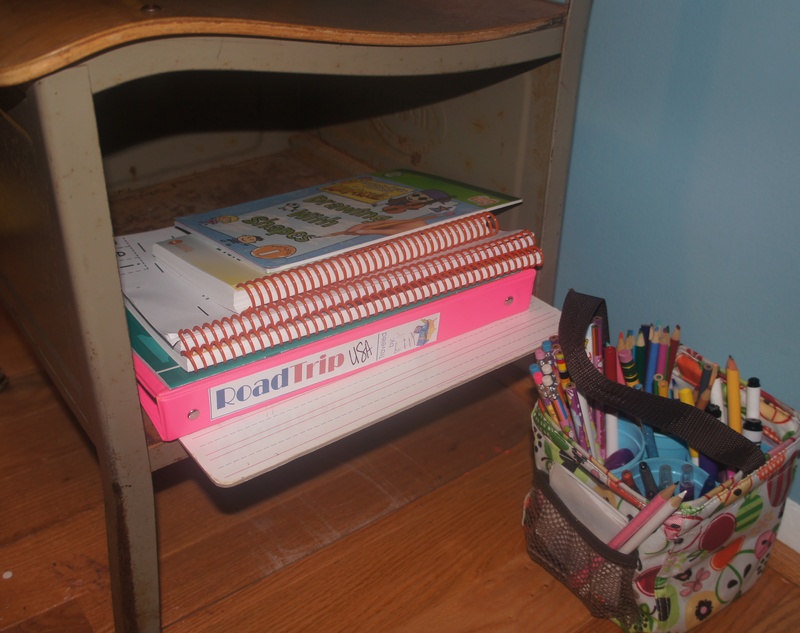 Inside each girl’s desk, we store their workbooks and binders, and their pencil bags are right beside their desk. New this year! 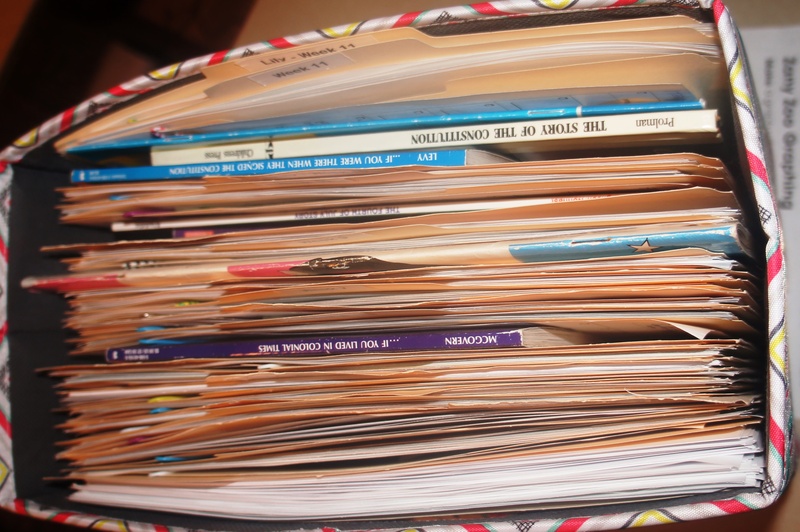 A file box to hold all of our “art” books. My girls love to draw, so I stocked up on various “How to Draw” type books. They love them. 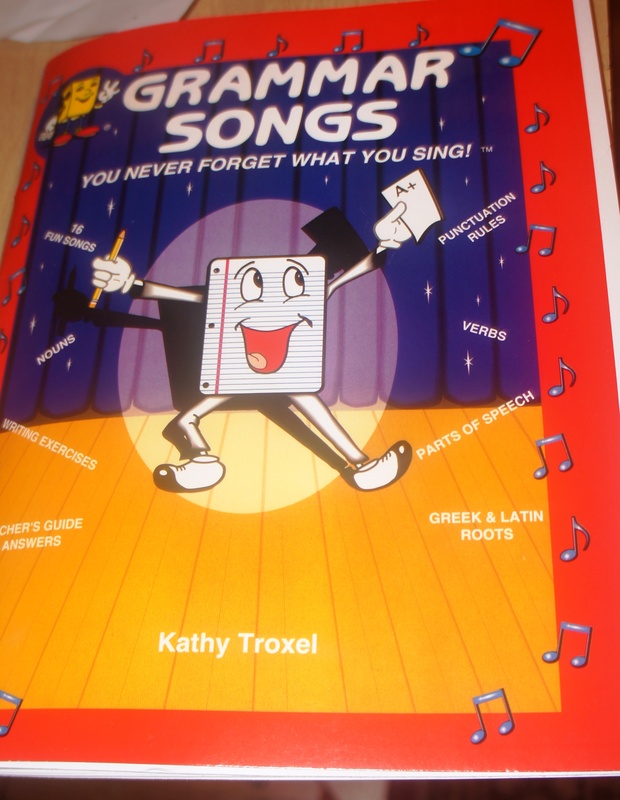 I make copies of the pages they want, so the books are completely reusable. 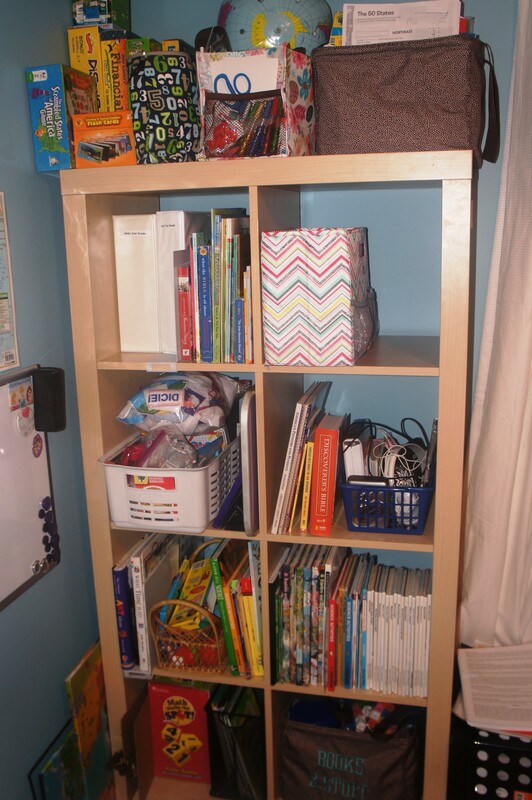 Here is our school bookshelf, which is jam-packed this year! 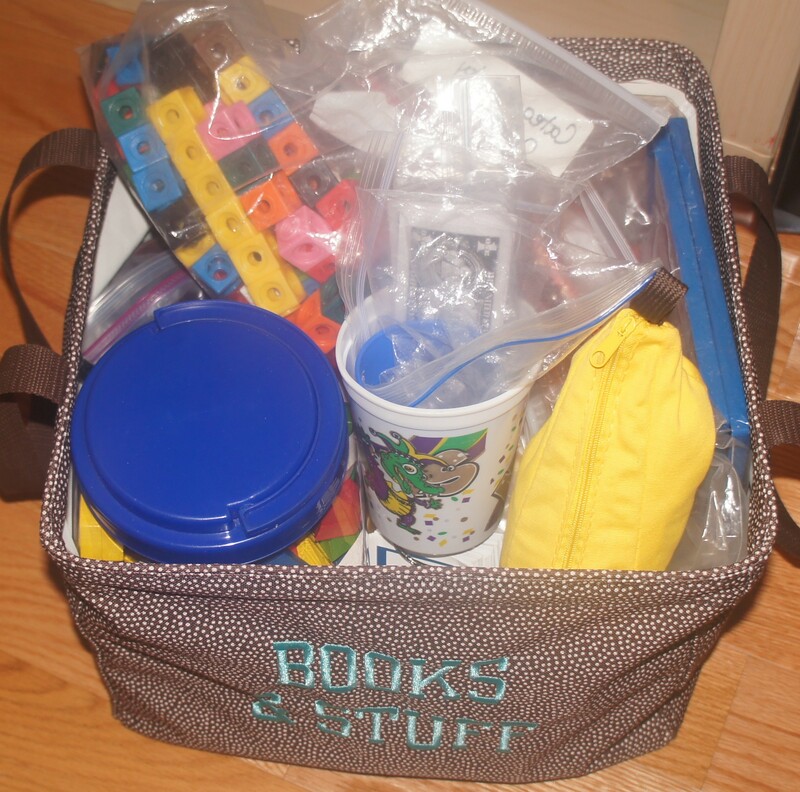 On top are various science project kits and curriculum related games. The blue bag with numbers is my “prize bag” for the girls. 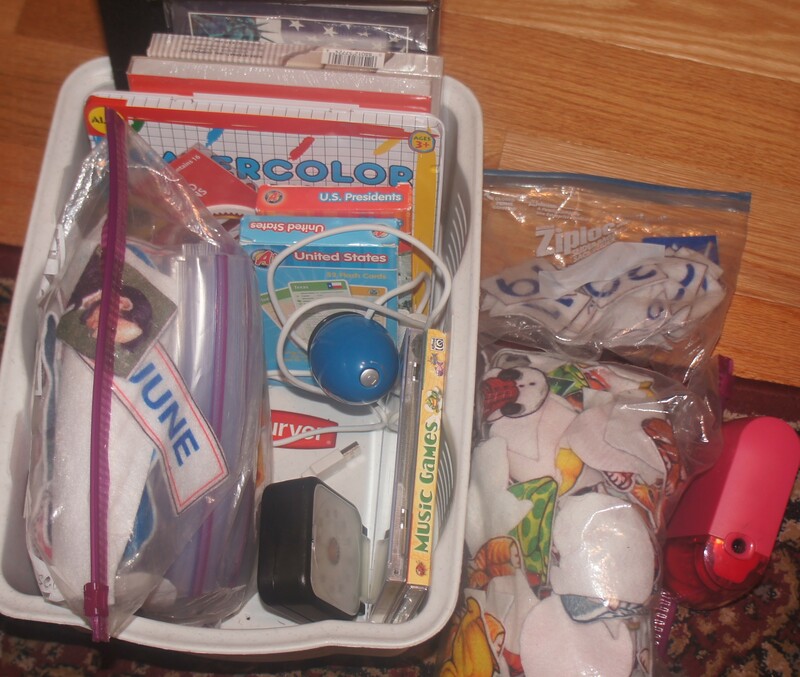 The flower bag is my supply bag with more pencils, crayons, glue sticks, etc. (We have more stocked up in the basement. Just no room up here to put it!) 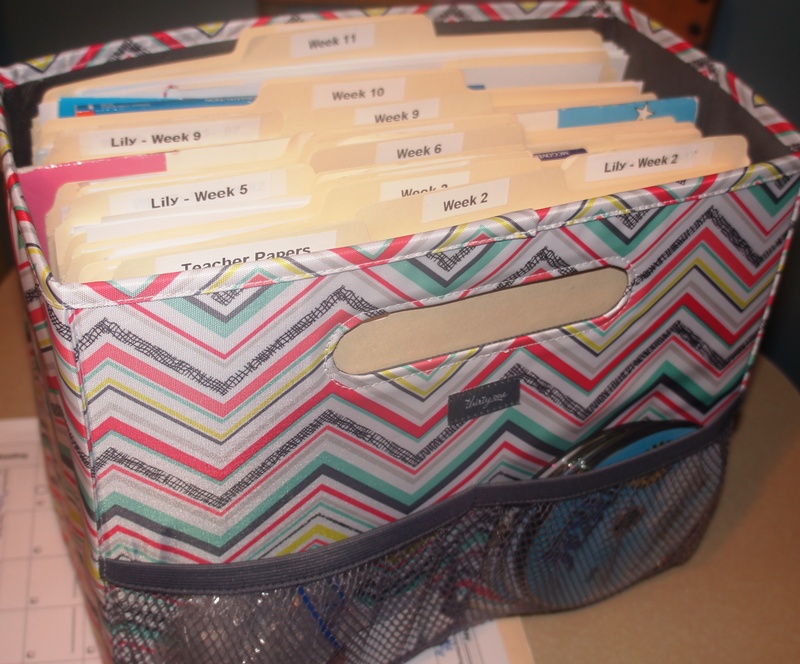 And the brown tote at the top is our curriculum, all organized for the year. And here are a few pictures of the inside of the baskets/bins. 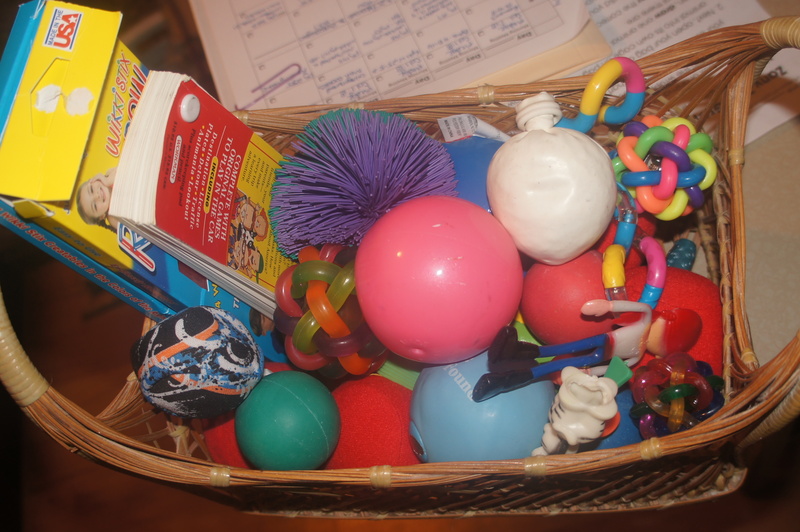 This is our “fidget” basket. 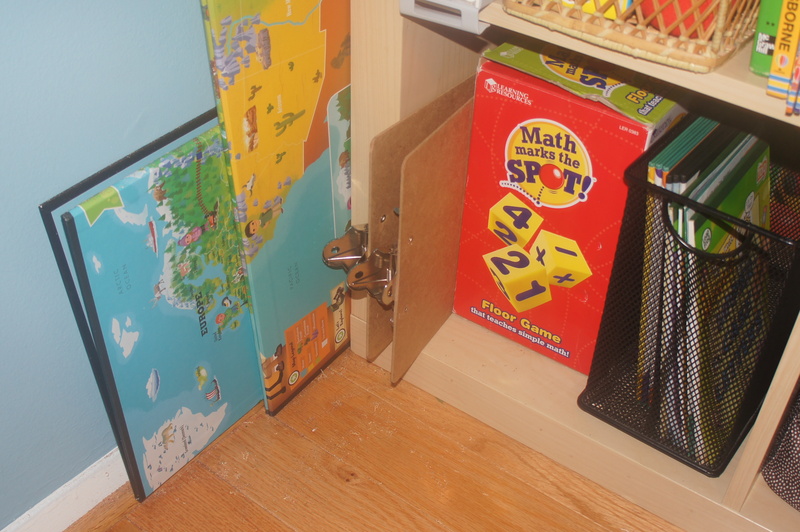 And, at the bottom of the bookcase, just part of our Tag Reader stash. 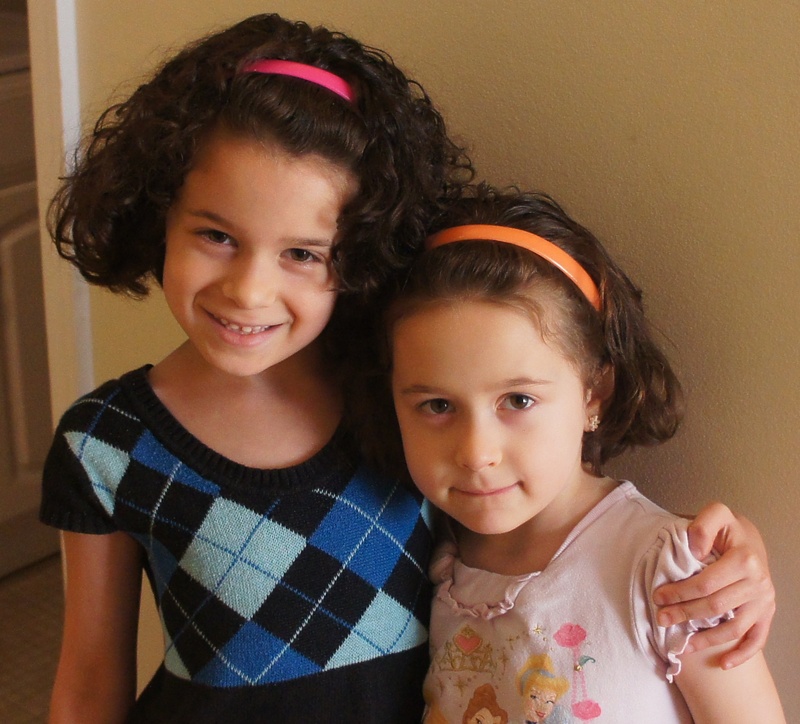 I absolutely love Leapfrog products – and my girls love them more. 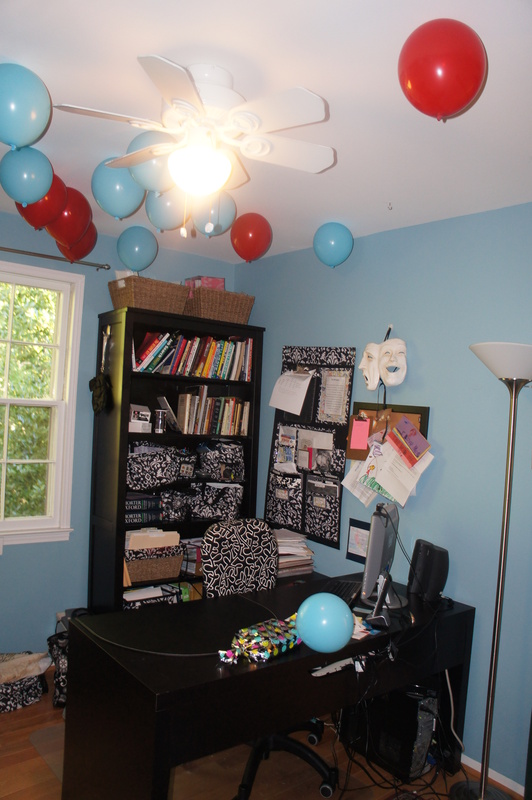 And so, this is what my girls walked into on Monday Morning! But more of that very very soon!